It’s the beginning of the new year and the trade show season is about to begin. 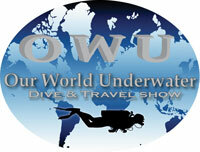 This year the focus will be on dive and travel shows. We tried the Surf Expos and the Adventure Travel Shows in the past six years but are going back to focusing on consumer shows that specialize in scuba diving and diving related adventure travel. There is a high concentration of specialized exhibitors in the exhibit halls and the seminars and workshops are tailored to divers who want to spend their recreational dollars on what interests them the most. Our first show this year will be in Dallas (Frisco), Texas, on January 22-24, 2016. Patrick Hammer and Jim Gentile from Our World-Underwater in Rosemont, IL are in their second year running a dive show in the Great State of Texas. The Texas Dive Market: Texas is a great market place for scuba diving. It has the 4th largest concentration of certified divers in the United States, only surpassed by Florida, California, and New York. At last count, there are approximately 135 Retail Dive Centers, at least 12 Dive Clubs and 6 Dive Boats that I know about. If our Industry shared statistics and demographics on our industry, we could tell you how many scuba instructors there are in the state and how many certified divers live there. Although I can’t tell you what the economic impact of scuba diving is in the State of Texas, I can tell you that it is significant. The fact that SeaSpace was one of the four largest dive shows in the country for 35 years tells you that there is a market for scuba diving in Texas and it is BIG. The NEW Dive Show in Texas: Only in its second year, the Lone Star State Dive Show is catching on fast. Patrick Hammer deserves a shout out for putting together a very promising show this year. Based on his experience in running Our World-Underwater in the Chicago area, Patrick has put the right pieces together to make this a great show. The show will have Workshops, Seminars, a Film Festival, an Exhibit Hall and a special Regional Summit Conference for members of the trade. Seminars, Workshops and Film Festival: The Show will feature 36 seminars on Saturday and Sunday, presented by 23 Speakers, many of who are the “Best in the Business”, like Cathy Church and Jill Heinerth. The topics are varied, and include everything from adventure travel, marine conservation, technical diving, exotic marine life to secrets of great underwater photography. The Saturday Film Festival will be hosted by Nancy McGee and include the works of Jill Heinerth and 10 other Speakers. Cathy Church is conducting two 3-hour workshops on Saturday and Sunday that will help any underwater photographer get better results from their digital camera and underwater lighting. The Workshops, Seminars and Film Festival will bring world-class education and entertainment to a great diving hub that has been deprived of such diving activity for too many years now. Something For the Texas Dive Professionals: There will be two activities for Texas Dive Professionals before the show begins on Saturday. On Friday, from 8:00 am to 5:00 pm, PSI Cylinders is conducting a Visual Cylinder Inspection Course for Industry Repair Technicians. From 1:00 pm to 4:00 pm, the first South Central Regional Summit Conference will kick off to address the “State of the Industry” for Texas Retail Dive Centers, Local Dive Clubs, Local Boat Operators and Local Scuba Instructors.” Guest Speakers will include Rick Stratton (Scuba & H2O Adventure Magazine), Gene Muchanski (Dive Industry Association), Tom Ingram (DEMA), William Cline (Industry Consultant and DEMA Board Member), Eric Peterson (Scubapro), and Jennifer Idol (Photo Journalist who has dove all 50 States). The three hour conference will include 1 hour of Introductions and Guest Speakers, a 1 hour breakout session to discuss industry and regional challenges, and a 1 hour summary of what can be done to make the local diving community stronger. Admission is free but space is limited to 50 Industry Professionals. Please RSVP with Gene Muchanski at gene@diveindustry.net or call Gene at 321-914-3778. The Exhibit Hall: The Exhibit Hall will be open on Saturday from 9:00 am to 6:00 pm and on Sunday from 9:00 am to 4:00 pm. There will be 61 Exhibitors in 70 Booths, consisting of dive equipment, dive training, local dive clubs, dive stores and some of the best travel destinations on the planet. Oceanic & Hollis will present their complete line of diving equipment and be there to support their Texas Dealers. The National Association of Underwater Instructors will be on hand to show why they are “The Definition of Diving” in Texas and Worldwide. Summary: The second annual Lone Star State Dive Show has all the makings of a wonderful show for the local diving community. The Travel Industry has embraced this show and they are looking forward to promoting diving in Texas. With the increased potential this venue has in the future, it will no-doubt get the attention of the manufacturing sector and the training agencies for next year. Editorial: Patrick and Jim – Thank you for putting in the time and effort for making this show happen. It is exactly what Texas has needed for a long. With good advertising to the diving community and support from the diving industry, this show has the potential to recapture what we once had with SeaSpace, in Houston for 35 years. We’ll see you in Dallas on January 22-24, 2016. Executive Director of Dive Industry Foundation. The Foundation is a non-profit, tax-exempt 501(c)3 charitable organization. We are the Founding Sponsor of DIVE LOCAL and soon to be just one of many. This entry was posted in Events, South Central U.S.. Bookmark the permalink.